After spending four perfect days in the French capital, I ventured on a few day trips from Paris, and that was the best decision I took. Despite the dull and cold weather in Paris, I decided to go to Versailles, and to my surprise, it was a beautiful winter day: sunny with crisp and clean air. The palace was a short walk from the train station, and luckily, I had a skip-the-line ticket. France is one of the most visited countries in the world, so purchasing these tickets is essential to enjoy your trip. Anyway, Versailles is the most common choice, but it’s not the only one. France has a lovely countryside and smaller cities where you can spend a fun day or, who knows, even go on an overnight trip from Paris. But that’s not all. You can also go on a day trip to other countries, especially if you’re short on time and can’t stay there any longer but want to see a different culture anyway. Ready to learn about the best day trips from Paris? Read on! Most of these day trips are easily done by train, for others you’ll have to take a bus, but don’t worry as they are all easy to reach. 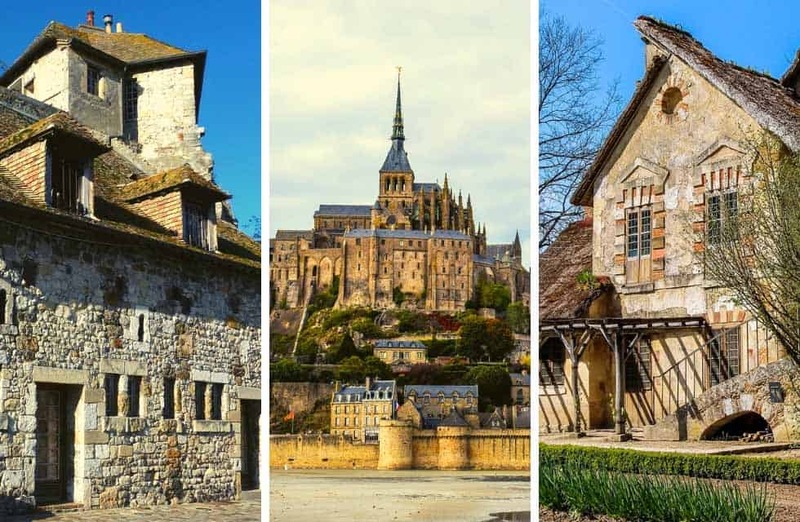 This list starts with the day trips to other countries from Paris, such as the Netherlands, Belgium, and England, then you will find the best day trips in France only. Fall in love with these photos like I did. Book your train tickets in advance if you’re going to neighbor countries. I found the best rates when I looked for tickets three months ahead. Click here to compare prices. Prefer to drive? No problem, just be sure to rent a car in advance to avoid last minute issues. We use and recommend Booking.com to reserve accommodations in and around France. Browse for deals here. Need internet abroad? Paris has a vast network of public WiFi, but you may not find it in smaller towns. Skyroam sells and rents WiFi devices to use worldwide (and share with your friends!). Check prices for Skyroam here. Pssst: Don’t forget to use your coupon MAPSNBAGS. Save time in Paris tours and museums by purchasing your skip-the-line tickets. France is one of the most visited countries in the world, so long and slow-moving lines are common in Paris attractions. Click here to check prices. Leave the romantic Paris to spend a day in the liberal Amsterdam. This is probably one of the best day trips from Paris by train because you go directly from one city to the other. No stops. From visiting a historical beguinage to strolling along the canals of the Red Light District, a day trip to Amsterdam will entertain all tastes. 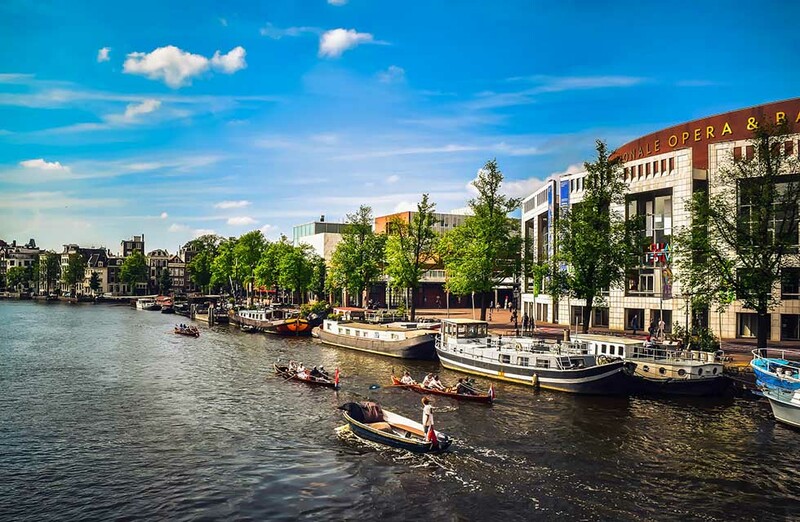 Packed with excellent museums, such as the Van Gogh and the Anne Frank House, reserve the rest of the morning to visit these sites and learn more about these iconic people’s lives. Then, go check a bucket list item: cruise in the canals, which are a UNESCO World Heritage Site, by the way. Wander through the Red Light District. Contrary to the common belief, this area can be charming and a walk here will show you the oldest houses in Amsterdam. Oh and be sure to visit Amsterdam North. This is a hip area with graffitis and cool cafes by the water’s edge. Perfect for photos. You won’t want to miss it. If you want to taste some Dutch beers, stop by the Arendsnest Cafe, the local’s favorite beer cafe and one of the best things to do in Amsterdam after a day of sightseeing. Pro tip: Always purchase your skip-the-line tickets in advance, or you will spend way too much time in line. To get to Amsterdam from Paris, take the high-speed Thalys train at Gare du Nord station to Amsterdam Central. The trip takes around 3h30m and a one-way ticket costs around 40 euros. It may sound counter-intuitive to visit a whole other country as a day trip from Paris, but Luxembourg is worth it. Spend two short hours on the TGV, and you’ll be able to bag a whole new country! 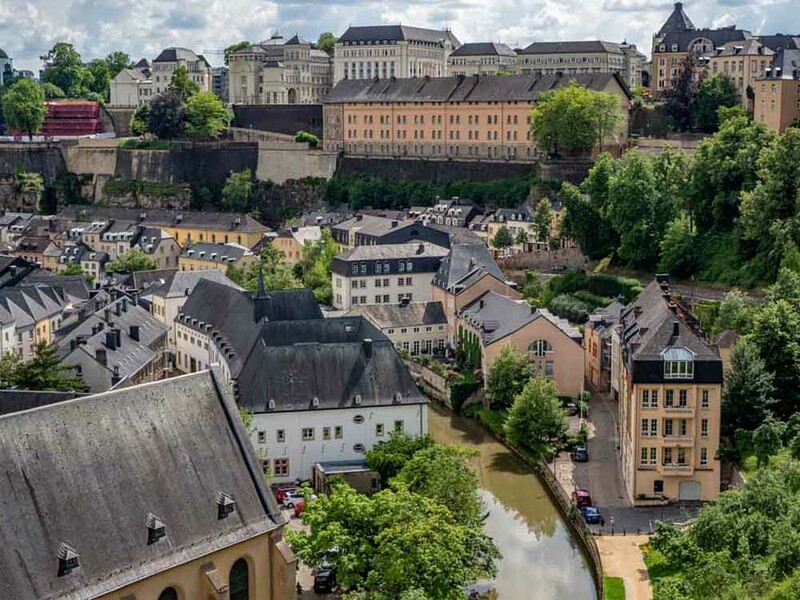 It’s worth visiting because Luxembourg City has a UNESCO designed Old Town with defensive fortifications and cool museums located on a fairy tale setting overlooking two rivers. Your Luxembourg itinerary should start at the Letzebuerg City Museum where you’ll get an excellent overview of Luxembourg’s history. Then check out the beautiful stained glass at the Cathedral Notre Dame. Stroll downhill to the Chemin de la Corniche, which has Instagram-worthy views overlooking the Alzette river and old Grund neighborhood. Alternatively, you can take a walking tour offered by the Luxembourg tourism bureau. Be sure to leave time for the Bock Casements. They are a rabbit warren of caves and defensive fortifications built directly into the cliffs overlooking the river. Finish up your day in the Grund with dinner at Oscar’s Bar and a beer at Scott’s. If you leave on an early train and come back in the evening, you’ll have time for everything I’ve mentioned above. Book your TVG tickets well in advance because the closer you are to the date of departure, the more expensive they get. To get to Luxembourg from Paris, take the TGV train at Gare de l’Est station to Luxembourg station. Normally, the ride takes around 2h20 min and a one-way ticket costs around 52 euros. 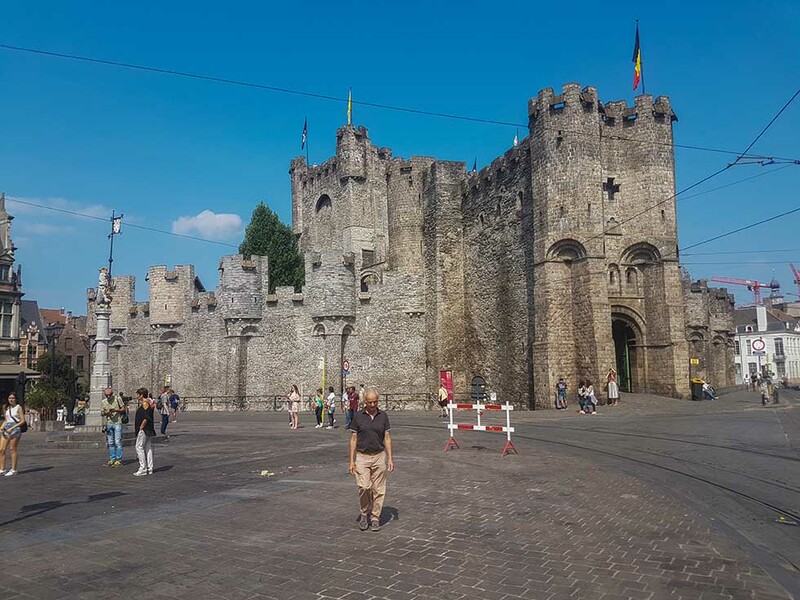 Ghent located in western Belgium is not your typical day trip from Paris, but it is very doable and most definitely worth a visit. It’s also an ideal location in which to explore the rest of Belgium should you decide to extend your trip. Once you reach the city, you should immediately head for the centre. It is a beautiful medieval town which leaves many visitors wishing they could stay longer. Once a significant city of commerce and trade, its beautiful architecture still stands and is now home to many artisans, students, and visitors to the town. The city centre is fully pedestrianised so you can get around most easily by bicycle or on foot. Most of the major sites to visit are cathedrals, churches, and castles with the most prominent being the Belfort en Lakenhalle, Het Gravensteen (a former castle) and Sint-Niklaaskerk (another church). Once in the city, you must try some of the local Flemish cuisines such as Gentse waterzooi which is a fish or chicken soup. Ghent can be reached from Paris most easily by train or car, however, it can also be reached by bus. Then the journey will take around 3 hours and should you leave early in the morning this will give you plenty of time to explore the city and return. Eurolines and Flixbus both run regular services from Paris to Ghent, some via Lille. If you want to go by train, take the high-speed train Thalys at Gare du Nord station to Gent Sint Pieters station. The trip takes around 2h and you have to change trains in Brussels to a local train. One-way ticket costs around 42 euros. 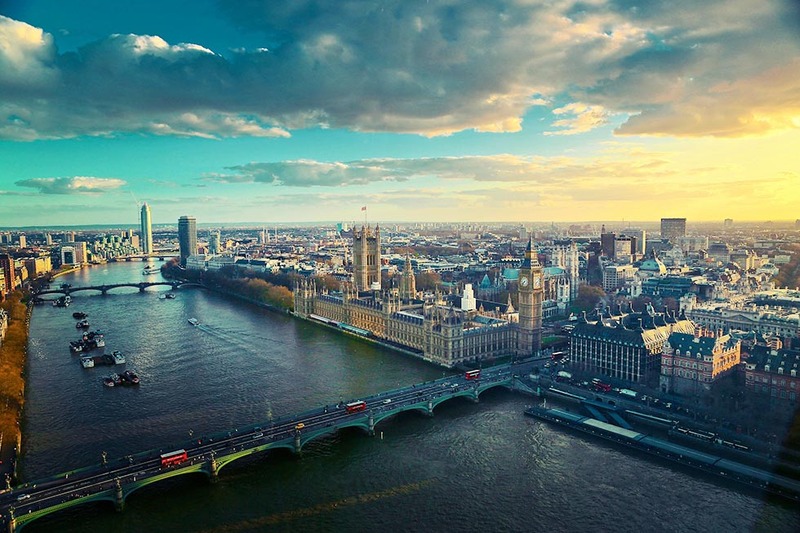 Although it is across the sea, London is the perfect day trip from Paris! The Eurostar train makes easy to hop between the two cities. This train trip is a fantastic experience in itself, especially if you can indulge in a first class ticket! Kick off your day at St Pancras railway station, an exceptionally centrally located station with easy access to tube, buses and also some of London’s best sites which make it the perfect place to start your day trip! From posing at platform 9 3/4 at the next door kings cross or taking a short walk to one of the world’s best museums to see the Elgin marbles or the Rosetta Stone at the British Museum, there is plenty to see on st pancreas doorstep! For those with more time in London, you could visit some of the city’s most iconic sites such as the tower of London and Buckingham Palace! No visit to London is complete without a trip to the pub for a pint or some fish and chips but for those with a slightly bigger budget, why not try and grab lunch at one of London’s many Michelin starred restaurants! And to finish off the day why not hear to the champagne bar at the stunning St Pancras hotel before hopping back on your train to Paris! To get to London from Paris, take the Eurostar train at the Gare du Nord Station to St Pancras station. This trip takes around 2h20 min and costs 60 euros. Sometimes, you have to take the TGV to Lille and from there you take the Eurostar to London. This trip is a bit longer and it lasts 3h20 min. Ticket: 86 euros. Located less than a 2-hour train ride away, Brussels, Belgium is a fantastic day trip from Paris. It’s got so many things to do, from art museums to beautiful art nouveau architecture and delicious restaurants. 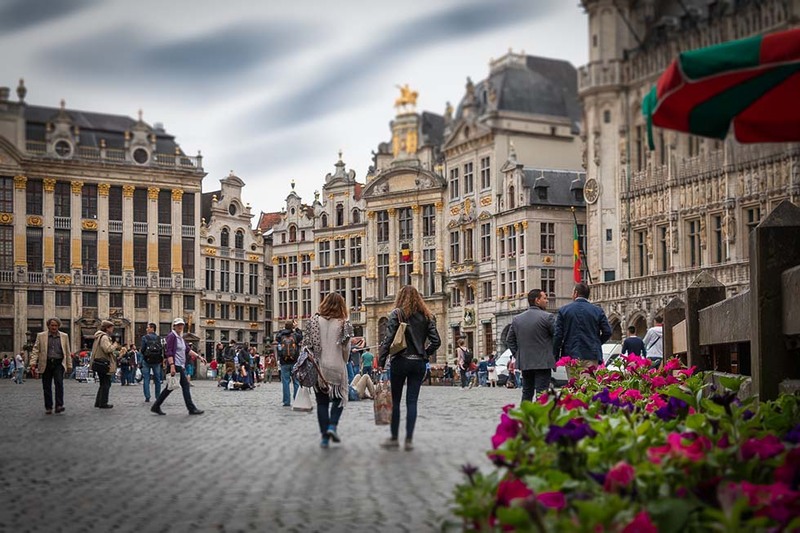 The Grand Place is known worldwide for its gorgeous guildhouses and cute town square. There are even a couple of museums here, including the Museum of the City of Brussels with exhibits depicting the history of the city. The Brussels City Hall is also located here, they offer tours of the inside educating visitors on the Belgian government. Aside from Paris, Brussels is also a fantastic destination for visiting some of the most famous art nouveau buildings in the world. Check out the exterior facades of Victor Horta’s Hotel Tassel, Hotel Solvay, Hotel van Eetvelde, and see the inside of the Horta Museum (once Maison and Atelier Horta). Foodie travelers will love the Brussels waffles, Liege waffles, Moules Frites (mussels with fries), steak frites (steak and fries), Belgian brews, and Belgian chocolates. Waffles can be found at many storefronts throughout the city, especially around The Grand Place area. Be sure to visit Galler Chocolatier, Frederic Blondeel, Passion Chocolat, and Pierre Marcolini for some of the best chocolate. For amazing Belgian mussels, be sure to go to Le Chou de Bruxelles. Delicious steak frites can be found at Le Bistro. To get to Brussels from Paris, take the high-speed Thalys train from Gare du Nord in Paris to Brussels-Midi Station in Brussels. Depending on the train, this ride can take anywhere between 1h20 minutes to 1h50 minutes. The ticket costs 35 euros. Versailles is located in the Ile-de-France region and is about 20 kilometers from the capital city of Paris. Due to its distance, Versailles makes for an ideal day trip from Paris and can be included in short travel itineraries. King Louis XIV founded this city of about 88,000 residents in the 17th century. Versailles is famous for the Palace of Versailles or in French, Château de Versailles, where King Louis XVI and Marie Antoinette lived together. Moreover, this is also where many important treaties were signed, including the Treaty of Versailles that ended the first World War in 1919. The palace grounds also has a stunning garden for you to explore. The city of Versailles is also a foodie’s paradise. As the location of Versailles is in the suburbs, you get access to amazingly grown foods and pretty much enjoy princely dishes. There is a reason why King Louis XIV decided to make this city the seat of royal residence. The town is a gorgeous French suburb – relaxing, classy and romantic. If you love to shop, then the city of Versailles is also ideal as most luxurious European brands have stores here. This is possibly one of the easiest day trips from Paris. So, the best way to get to Versailles from Paris is to take the train. The ticket costs about 7 euros, and you can buy it on the same day at any metro station. Then, make your way to an RER C station, and take a train towards Versailles Château station. Click here to see a map of the RER in Paris. 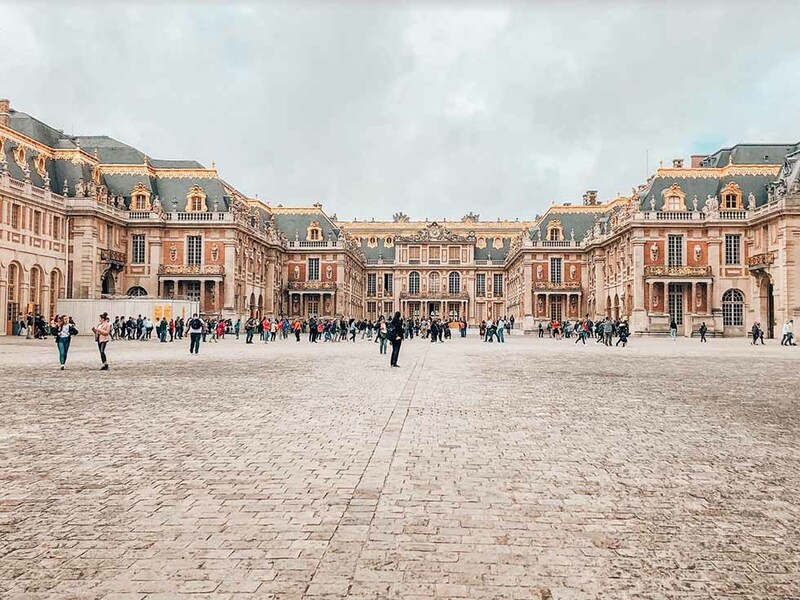 If you are not taking the train, then another way to reach and explore Versailles is to go on a day tour to the Palace and its neighboring areas. 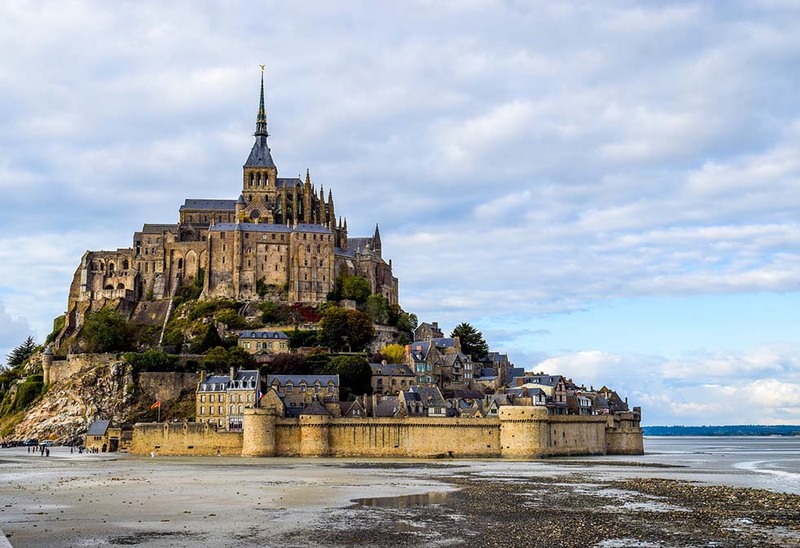 Mont St Michel has to count as one of the most stunning places to visit in France. The abbey is set upon a natural island, and it’s magical to see the way tides affect the look and feel of the abbey complex. You can be submerged in water altogether one minute and then be able to walk across with no waves in sight the next minute. Visiting the place, built in the 8th-century, from Paris is a long day affair but completely worth it. The abbey, after all, holds more than one secret. It has long been used not just for religious functions but also as a prison while the museums will tell you about daily life from the abbey’s earliest days. In general, the main street is lined with tourist tats and some delicious local food apart from standard pizza/ pasta fare. It’s a fun activity before you begin your long journey back to Paris. Alternately, you could bid adieu to the tourists by evening and stay at one of the hotels with just a few locals on the island. You will be enveloped by tides close to one of the most spectacular abbeys in the world. And that’s something worth doing while visiting Mont St Michel. To get to Mont St Michel from Paris, take the TGV train at Paris Montparnasse station to Rennes station. From there, walk to the Gare Routiere bus station and take the SNCF bus to Le Mont Saint Michel. The whole trip takes around 3 hours and it costs 65 euros. About an hour and a half northwest of the hustle and bustle of Paris on A14/A13, a day trip to Giverny feels like stepping into an Impressionist painting. The residents of this small French village live in half-timbered homes surrounded by lush and colorful gardens that immediately bring to mind the scenes captured by Cezanne, Renoir, and Pissarro. But the best reason to take a day trip to Giverny from Paris is to tour the house and gardens of perhaps one of the most famous Impressionist artists of all, Claude Monet. Spotted from the doorway of a train taking him from Vernon to Gasny, Monet fell in love with the village of Giverny at first sight. He quickly moved his family to the pink adobe farmhouse with emerald green shutters set on two acres of land in May 1883. For the next four decades, Monet would lovingly sculpt the impressive flower garden visible from most rooms of his home and the water garden at the edge of his property. Full of color eight months of the year, the plants, trees, and flowers of Monet’s flower garden inspired many of his paintings. In the water garden, walk over the forest green Japanese footbridge and gaze out at the water lilies that inspired one of the artist’s most popular series. 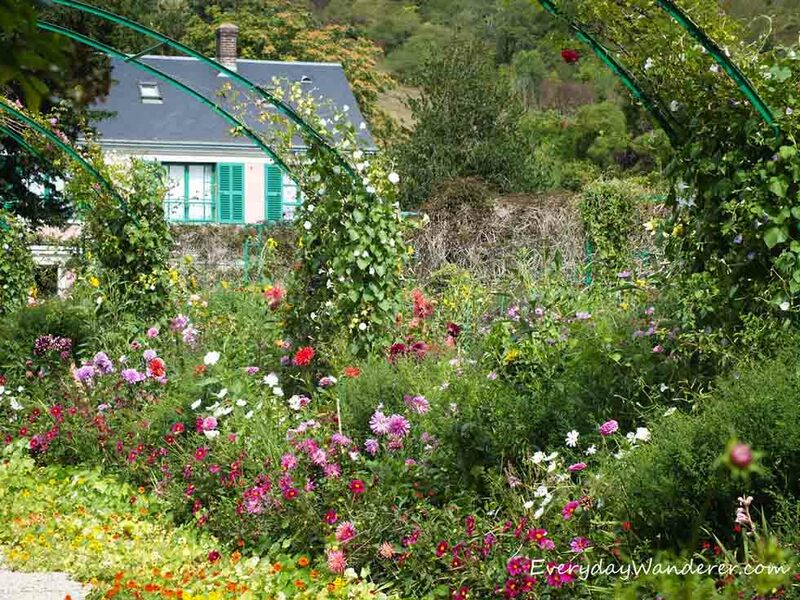 A day trip to Giverny from Paris is one of the most beautiful experiences you can have in France, but you must plan ahead. Monet’s house and gardens are only open seasonally from March through October. To get to Giverny from Paris, take the SNCF train at Gare Saint Lazare station to Vernon station. The trip takes 50 minutes and it costs around 10 euros. Lille offers attractions to cater to everyone’s taste. Some of the best places to visit in Lille are Palais des Beaux-Arts de Lille which is an art museum, Lille Cathedral and as well as Vieux Lille, the old part of the city. Beffroi de Lille is the iconic bell tower of the town which makes Lille’s landscape even more beautiful. 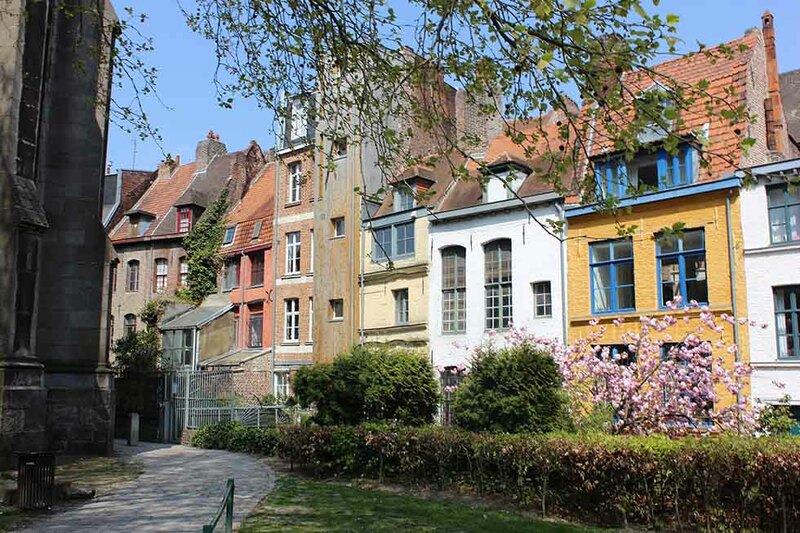 Visitors can also take a stroll at the local park, Citadel of Lille, that also has a historic fortress. The French city also has a vibrant nightlife with a young student atmosphere. But, it is also perfect for families or couples, for example, its Christmas markets and fairs are trendy among tourists; As well as the annual Lille’s Flea Market. In conclusion, if you have never been to Lille yet, it is definitely worth your time. To get to Lille from Paris, take the TGV or Eurostar train at Gare du Nord station to Lille Europe. The trip takes around 1 hour and it costs about 20 euros. Despite its diminutive size relative to neighbouring Reims, the town of Epernay, located east of Paris, is the capital of the famous Champagne region. The centre of town will strike you immediately as beautiful and affluent, defined by the magnificent 19th-century houses built with the wealth that the champagne trade brought in. Avenue de Champagne is the focal point for exploring glasses of this delicious wine, a leafy boulevard lined with some of the great and famous champagne houses of the region. Here, you can explore some of the 250km of cellars that lie beneath the surface, stocking bottles well into the millions! Most of the houses here are open to visitors (although booking is well advised), whether it be a grand marque of Moet et Chandon or one of the smaller names, such as Alfred Gratien, you’ll enjoy a great degustation of fizz! After a day of wine tasting, there is an excellent food scene in the town to satisfy your rumbling stomachs. C. Comme, a famed wine bar in the city, offers (of course) more champagne tasting, but also a good selection of casual food, including cheese, charcuterie and, naturally foie gras! Head back to Paris a few bottles of champagne heavier after a lovely day exploring one of the most famous wine towns in the World. To get to Epernay from Paris, take a direct TER train at the Gare de l’Est station to Epernay. 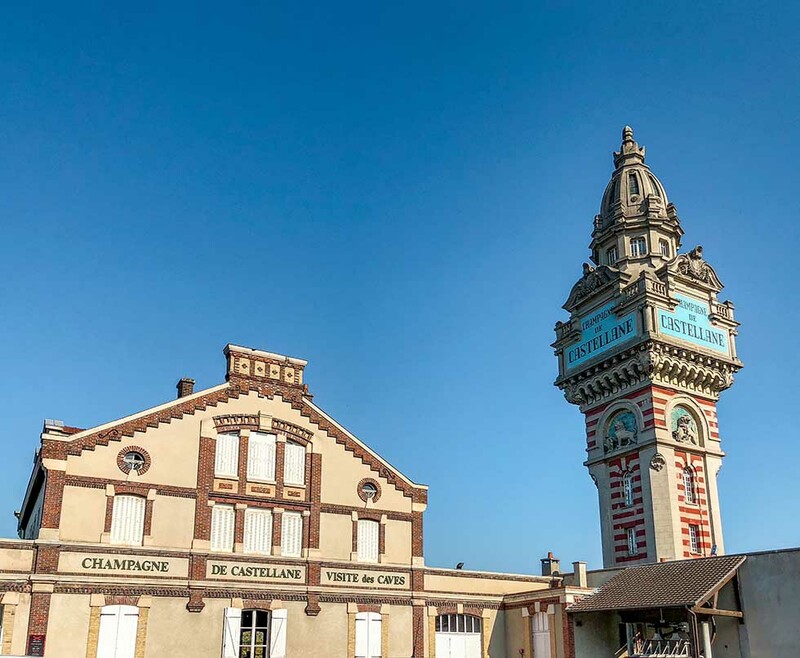 This beautiful town is only 1h20 min away from Paris, which means you will get to the heart of the wine region in no time at all. The trip costs 30 euros. Paris to Chantilly is a great day trip from Paris by train. 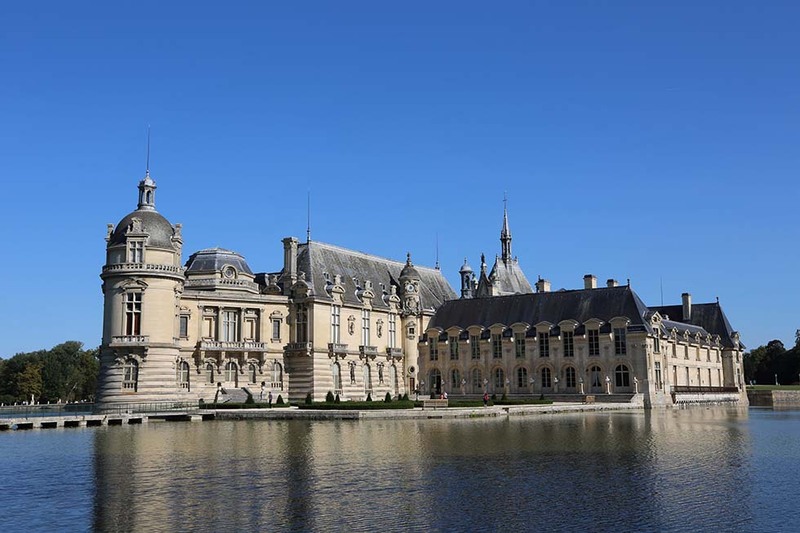 Chantilly is best known for the Chateau de Chantilly, a beautiful construction emerging from a lake. The chateau is home of a beautiful library and also the second most important collection of artwork in France, only after the Louvre Museum. Like many chateaux in France, Chateau de Chantilly is surrounded by beautiful English and French gardens designed by André Le Notre, the same gardener of the Versailles Gardens. The gardens are decorated with classic sculptures, fountains, and water games, and it is delightful to walk around when the weather is nice. Chantilly is also known for the Great Stables of the Princes de Condé, built in the 18th century for the 7th prince de Condé. During his life, the Great Stables hosted more than 200 horses and 500 hounds, and the prince liked to organize dinners and horse shows under the high dome. Today a part of the Great Stables hosts Museum of the Horse, focused on the relationship between horses and men since the beginning of the civilization. The Stables are also home of 30-40 horses (mostly Iberian horses or draft horses) which receive daily care and education by a team of highly qualified grooms and riders. The horses are also trained for equestrian shows and regular performances in the Dome which are included in the museum visit. Direct trains leave from Gare du Nord every hour and the journey lasts 25 minutes only. At the Gare du Nord station, take the direct TER train to Chantilly-Gouvieux. It costs about 10 euros. I will list below some reasonably priced Get Your Guide tours which I researched, read reviews, and compared. Note that I only mention tours (and companies) that I would take myself. If you prefer, you can also check Viator tours here. 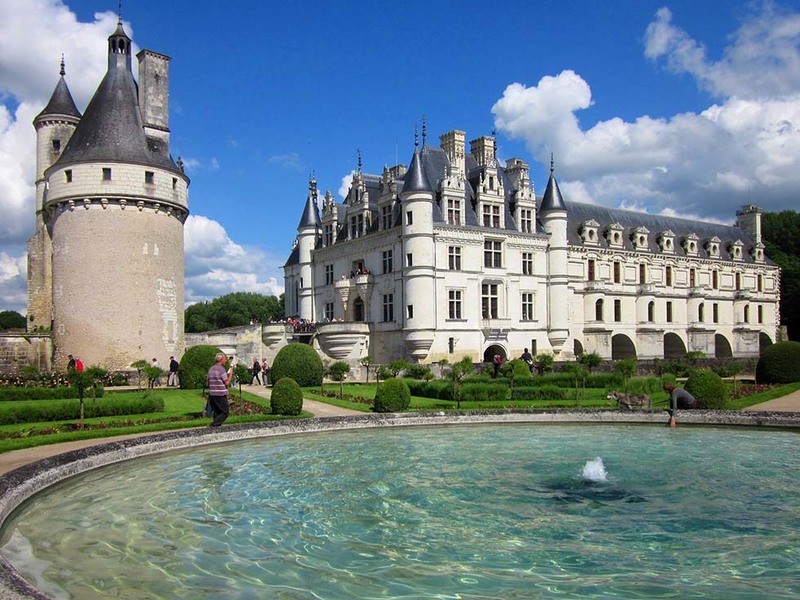 This tour takes you from Blois, a town south of Paris, to visit three stunning castles in the Loire Valley. You get a discount on the entrance tickets (and a skip-the-line), but no food is included. Full entrance price for the three castles: 74 euros. Cons: You have to find your way to Blois and spend more money in an overnight there, so the guide can pick you up in the morning to go on this day trip. Pros: The tour itself is the cheapest in Get Your Guide. Click here to check the price and read some more reviews. Personally, I prefer this tour to the Lorey Valley Castles because it’s hassle-free. 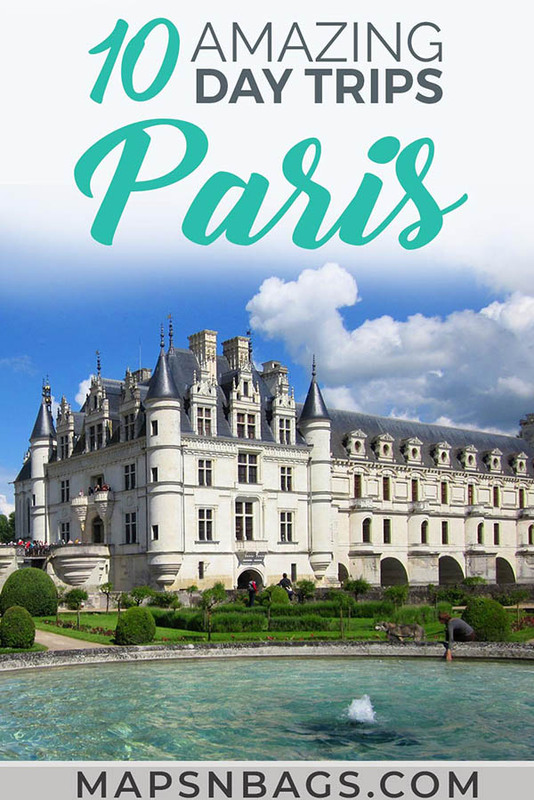 This tour will pick you up in the 14th arrondissement in Paris and take you to visit the Ambroise, Chambord, and Chenonceau castles. All gorgeous! Cons: A bit pricey. And the pickup location is not in the city center. Pros: Entrance tickets for the castles are included. Three-course lunch with wine included. Perfect tour for either history lovers or non-war buffs. You can learn a lot about the WW2 events following the D-Day and also what were the allied plans and thoughts when they arrive in Normandy. This tour takes you to the beaches were the soldiers arrived, to a war museum located in a former German bunker, to the American Cemetery at Omaha Beach and many other interesting sites. Cons: They don’t pick you up at your hotel. Pros: Meeting point is near the Eiffel Tower in the center. Knowledgeable guides. Lunch and a glass of cider included. Entrance tickets included. And you? If you could choose any of these places to visit today, where would you go? 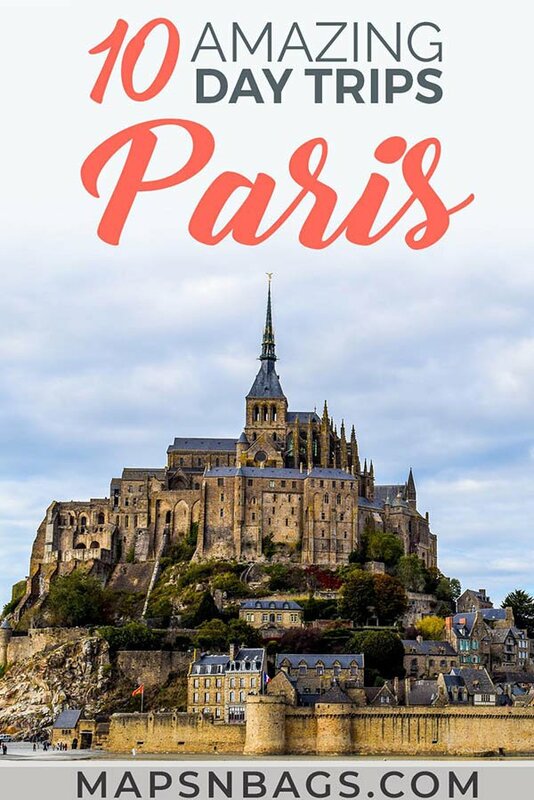 Have you been to other day trips from Paris than the ones in this post? Comment below your experiences or feedback. Let’s talk! Did you like this post? Then save it to your Pinterest board! This entry was posted in France and tagged Citytrip, Day trip. Great list! There are so many great options on this list. I love taking one or two day trips when in Paris. There are so many amazing places just a few short hours from Paris. Giverny is one of my favourites. It is so beautiful and peaceful. I love getting there right when it opens to avoid some of the crowds. The Normandy beaches are one of my favourites as well. It is so humbling standing on the beaches thinking about their history. The tour guides are so informative! You learn so much in such a short amount of time. Hi Erica, thank you for your comment! Yes, you can learn a lot on these day trips, that’s why it’s such an enriching experience! I love going on day trips. This is a great list! I was only expecting to find trips within the French borders. Thanks, Roy! Oh no, since Europe relatively small when compared to the US, I think it’s fair to go on day trips abroad as well. Glad you enjoyed it!